Disclosure: Please note that while we were not compensated for our meal, we were seated at Cowfish by management after my husband spoke to someone at corporate office. Despite the fact that we’ve been driving down the road to party it up at Universal Studios Orlando for nearly eight years now, it’s hard to pry my husband and me away from our beloved outdoor bars and into restaurants. Hey, we like to people-watch… how else would I be able to snobbishly judge passersby on the nerd culture displayed on their clothing? So we were a little disappointed to hear that one of CityWalk’s newest establishments, the sushi-burger fusion place Cowfish, had nixed its outdoor bar food service literally the day before we arrived. Typically, that’s how you get lazy, food-obsessed locals to swear vengeance on your establishment… hey, my name isn’t Inigo Montoya, I take my vendettas where I can. Cowfish’s menu had come so highly recommended, however, and from so many different people, that we had to give it a try. 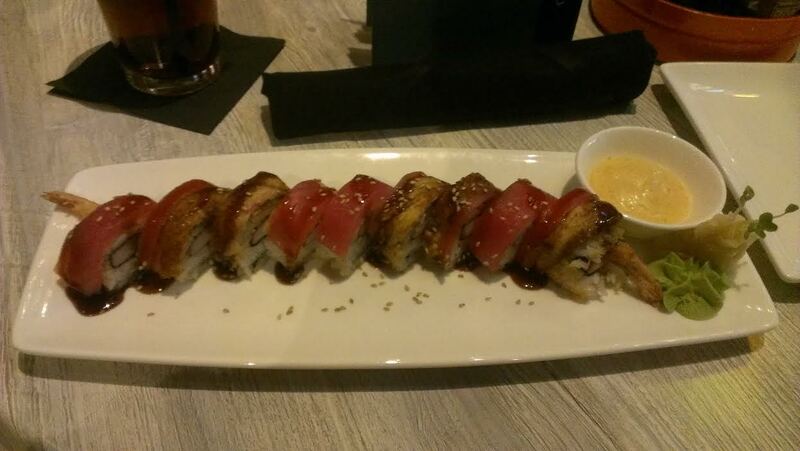 Turns out, it’s a good thing we did, since Cowfish is really, really worth the trip. Enough that we went twice just to tell you about different things! When we arrived at Cowfish, upon mentioning our totally-not-creepy-for-real preference to people watch, we were seated in a quiet upstairs room with a view that was, well, kinda perfect. While it’s easy to see how Cowfish might get noisy when it’s packed given how big it is and the multiple bars, at the time the vibe was mellow and casual. Service? Pretty exemplary… not only was our server Stephanie managing to balance being friendly with prompt and professional service, but we were visited several times throughout the meal by four different members of management, not just for Cowfish itself but CityWalk as a whole, all just checking in to make sure we were enjoying ourselves. One of the few complaints diners have made against Cowfish is lengthy wait times for food, but in our experience, they had the timing about perfect. Our appetizer showed up in a speedy fashion, with enough time for us to graze on it before our mains arrived, and not once did we feel rushed, which is one of the main reasons why we typically tend to be barfolk. The week before we’d actually stopped by their outdoor bar area and bought a round of drinks, which as it turned out hadn’t been a bad idea either… the Buffalos and Bacon cocktail is worth it if you like a simple, smooth bourbon drink, and hey… the candied bacon tastes like Honey Baked Ham. While it’s not hard to sell someone a good burger and good sushi, combining the two into one place is a little odd, and it gets odder when you start talking about fusing them like Dr Frankenstein… or, I guess, Wolfgang Puck. Still, it was, specifically, those very unique dishes that kept popping up when people insisted we needed to try Cowfish, and I was determined to do so despite my inherent fear of new things. We decided to start things out fairly simple with the calamari, which is one of those starter staples that is a good way to judge what you’re in for. The pieces were thick enough that I was surprised they were still so tender and not chewy, with a heavy but crunchy breading that stood up to cooking very well. The sauce, spread on the plate beneath the calamari, was a light and sweet, and very mildly spicy-sour affair that perfectly fit the calamari itself, not too cloying, not too heavy. The portion was more than big enough for two people, and I likely would have made a bigger dent in it had I not sensed a carb coma looming on the horizon. My husband went a familiar route with the Fusion Specialty Bento Box, which includes a mini-burger, sweet potato fries, edamame, Thai cucumbers, and your choice of either four pieces of one of the three different Fusion Specialty rolls, or three pieces of mixed nagiri. It may look small in the photo, but it’s a solid amount of food, and is the sort of combination that allows you to try a bit of everything. Neither of us (for it is the right of the spouse to poach tastes of the other’s meal) were taken by the sweet potato fries, which were crispy but very lightly seasoned, though the Thai Cucumbers were another story. What you’re getting there is a very lightly dressed sort of vinegar chopped cucumber salad with a gentle kick of spice, refreshing enough to make us glad it was an optional side for other dishes. He went with the Firecracker roll, which had shrimp tempura and kani inside and was topped with yellowtail and salmon, along with spicy mayo, masago, tobiko and scallions. This he proclaimed fantastic, and the four pieces are big enough for anyone, but to be honest, the real star was probably those cucumbers… if only because you can’t surprise a guy with something that tastes exactly like his deceased Polish grandmother’s cucumber salad, which he hasn’t had in well over a decade, and not expect him to develop a bit of a bias. Well played, Cowfish. Well played. Now, here’s where it gets tricky. Once upon a time, this article contained a loving homage to the taste sensation known as the Pittsburgoo-shi. I spent a paragraph or two marveling about how its “spring roll buns”, actually strips of crab meat and sushi rice between rice paper to form a sort of chewy flatbread, was a wonderful surprise. And then I had to delete all that because I decided to go back and try some of the fusion rolls and discovered in the intervening week since I’d last been there, that sandwich and several others had been removed from the menu. RIP Pittsburgoo-shi. The manager I spoke to about it said the change had been a long time coming, and was an effort to streamline the kitchen services and ensure patrons got their orders as fast as possible. Understandable? Sure. Disappointing? I’d be lying if I said no, since it was easily the most creative and unique thing on the menu. But hey, let’s take this as a sign that you and I should talk about their sushi rolls because, surprise, we should really talk about their sushi rolls oh my gosh. I wound up ordering the Georgia Roll… tempura shrimp and kani, topped with yellowfin tuna, eel, a sweet eel sauce, and a spicy mayo for dipping. You guys, Cowfish is not messing around when it comes to their sushi. This roll was perfectly formed so you could pick it up without it falling apart, and all the visible cuts were clean and sharp as a whistle. If the idea of sushi freaks you out, or if you’re just a little iffy on the texture of raw fish (as I am), this roll’s firm, chewy but not dense texture makes it a great choice to start. The tuna tastes clean, and the eel sauce adds just a little bit of sweet heat to it without overpowering the other flavors. The mayo was… well… the mayo was there. I tried a few bites with it, and while it didn’t taste bad, it also didn’t really add anything to the roll itself, which I happily devoured. My husband, unfortunately, did not fare as well this trip, with a hamburger that was supposed to be medium arriving nearly mooing the first go, and very well done the next. The cucumber salad? Still nostalgically delicious. Cowfish’s “Burgushi” rolls may sound strange, though once you look at them, they’re not really as odd as they seem. The High Class Hillbilly roll, with its pulled pork, barbecue sauce, and bacon coleslaw, for example, raises some eyebrows until you realize that none of the other items in it are traditional sushi ingredients. It isn’t pulled pork and fish, it’s wrapped in flash-fried potato, which goes with its ingredients quite well. Doug’s Filet roll may be the closest you’ll get to surf-and-turf-ish sushi, with filet mignon wrapped up with kani, cream cheese, and other ingredients, but is any of that really that terrifying in combination? The knee-jerk reaction when you first hear the words “burger sushi fusion” probably doesn’t match up with what you get when you start thinking about the ingredients in each menu item. These fusion creations are, largely, priced the same as everything else on the menu, so don’t feel like you’ll be breaking the bank if you already plan on going there. Cowfish also uses local ingredients whenever possible, so you know that whatever you try will be high in quality and fresh. Their prices, with the Pittsburgoo-shi clocking in at $18.00 and “standard” burgers in the $12-17.00 range, might make Cowfish a little high on the end of casual dining range, but for the quality and the location, it’s actually a pretty good deal. For two people with two drinks, each getting an entree and sharing an appetizer, our meal for our first trip hit at around $50.00 without tip, with our second trip clocking in at about $40.00. Not an unreasonable amount at all. And if you’re a Universal Annual Passholder, there’s the usual 10 – 15% discount depending on which pass you carry. If you’re aiming to try a lot of things, the best bet is likely to bring along other adventurous souls and share… all Fusion Specialty rolls are nine substantial pieces, which means if everyone is getting something different, there’s plenty to go around when someone wants to sample. And hey… turns out the nighttime view is even nicer. Just wait ’til the fireworks start going off. Cowfish is one of those places that seems intimidating in concept, but in practice, is just plain good eats. As of this writing, it doesn’t take reservations, so if you have your heart on eating there during your trip, you’re probably going to want to prioritize it sooner rather than later. Check with the host/hostess at the podium outside the restaurant and see if they can recommend another time to return. For large groups or families who simply want to grab a burger, it might be both too hard to get into until the initial craze wears down, and a bit pricey. For food fans who love to plan their trips around a good meal, however, Cowfish is more than worth the effort and cost. We’re already planning our next day trip… maybe we’ll see you there? Originally from the Canadian wilds, where I rode a polar bear to work every day and had to fend off moose to get to my daily ration of Nanaimo Bars and maple syrup (all true), I immigrated to Florida in 2007 when my husband and I got married at Epcot. A professional video game reviewer and editor since 2008, I use theme parks to help me unwind and fulfill my sass/shenanigan requirements, with passes to Busch Gardens, Universal Studios, and Disney World, all within an hour's drive. If you want the scoop on Halloween Horror Nights, or on how many molten lava cakes you should stuff into your face hole at Food and Wine (SO MANY), or anything in between, I'm your gal. 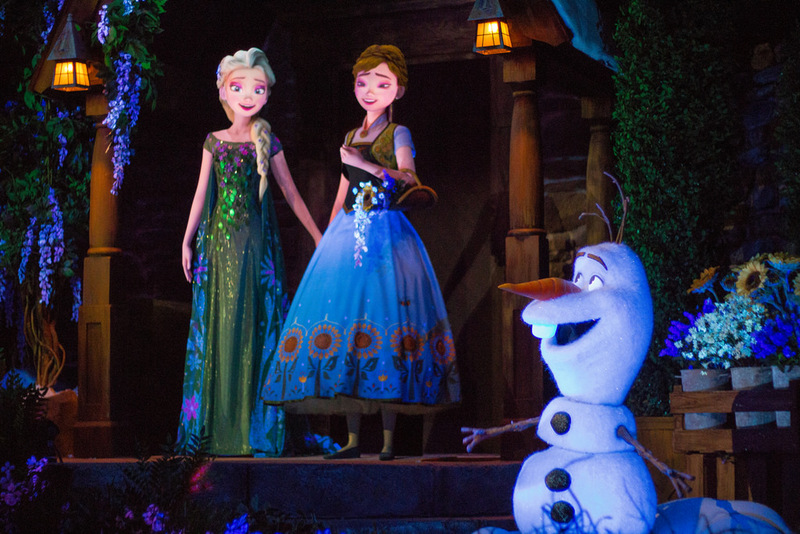 SATURDAY SIX: Six Reasons We Love EPCOT! I would be able to appreciate these food descriptions more if I knew what “kani” is. I’m guessing that it’s the official name of those seaweed sheets used for rolling, but I really have no clue. Am I guessing right? Kani is the name for the imitation crab used in some sushi.